I don’t often write about hardware, but the Samsung Series 9 ultrabook has caught my attention. It’s a nice step up from the existing Samsung Series 5 line of ultrabooks, particularly in the display resolution and CPU horsepower. As well, it stands out from the crowd of ultrabooks currently on the market as a sleek high-end device. But Back to Basics: What Exactly is an Ultrabook? Ultrabook laptops are taking off from where the netbooks of yesteryear left off. 2012 is promising to become the year of the ultrabook since the technology behind them has matured to the point where they are a viable alternative to traditional laptops. What defines an ultrabook? They are light-weight (typically below 4 pounds). This weight is achieved primarily by removing the optical drive (ie: the DVD drive) as well as replacing the traditional hard-disk drive (HDD) with a solid state hard drive (SSD). These days the loss of an optical drive is not a big deal when one considers their considerable weight. Almost all software and even movies can be bought online these days so the need to have an integrated DVD drive is non-existant. At this point in time we have what I see as two generations of ultrabooks. The first came out in 2011 and typically sport 1366×768 monitor resolutions along with 128 GB SSD storage. The second generation coming out in Q2 of 2012 has upgraded SSD storage along with resolutions running at 1600×900. This is where the Samsung Series 9 starts to become interesting. This is a second generation ultrabook running at a 1600×900 screen resolution. Its release date is rumoured to be in April of 2012, and numerous reviewers have looked at the product, so the final release to the public is likely imminent. The Samsung Series 9 is considered a premium ultrabook which means it is intended for a higer price range market than the mid-market Series 5. The screen is the main feature of this ultrabook that has me interested. Samsung is famous for its great displays and it appears that this is no exception. The Series 9 comes in 13″ or 15″ monitor sizes. A key feature of the monitors is that they are matte, not glossy. This makes a big difference in reducing glare and the resulting eye-strain. Also, several independent reviews say that the crispness of the Samsung Series 9 screen exceeds anything on the market. Samsung also makes the Series 9 monitors with their SuperBright Plus technology that runs at a brightness of 399 lux, and an auto-adjusting sensor in the ultrabook automatically adjusts the screen brightness based on the ambient lighting. This promises to make the screen crisper than any other ultrabook or laptop. Bottom line is that the Series 9 is the crispest display on the market. Further features of the Series 9 include a fast second gen Core i5-2537M (1.4 GHz) processor, a backlit keyboard, an ultra-tough duralumin chassis, and increased slimness (1.3 – 1.6 cm thickness). The backlit keyboard will adjust itself based on the lighting in the room to save energy during the day. I like this since older machines need you to manually toggle the lighting, which can grow to be tedious. Reports state that the Series 9 may ship with a default 4-8 GB DDR3 RAM. I am hoping at release the included RAM is 8GB since 4GB is somewhat low for a high end machine. Various performance test of the Series 9 show that the boot time is one of the fastest around, clocking in at about 16-17 seconds. Most people dislike waiting for a computer to slowly start itself, so there will be no such problem with this machine! The weight of the Series 9 ultrabooks is also significantly less than competitors with similar specs. The 13″ model weighs 2.4 pounds while the 15″ model weighs 3.5 pounds. 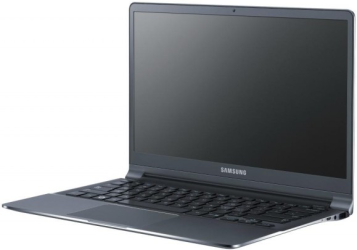 The graphics capabilities of the Samsung Series 9 are about on par with contemporary ultrabooks. The Core i5-2537 relies on the integrated Intel HD Graphics 3000 GPU, and although it can keep up with simple graphics operations, it slows significantly when expected to perform tasks such as running a game. On the flip side, the Series 9 runs almost completely silent, which very nice compared with some noisier machines that I’ve heard. So to sum things up, I think that Samsung has a very solid offering in its new Series 9 ultrabook. The series 9 will be a top of the line ultrabook for a while to come with key features such as Samsung’s outstanding monitor quality, the incredibly fast boot time, solid duralumin chassis, silent running, as well as the Series 9’s extreme light weight and thinness. All-in-all, I think we have an outstanding machine that I am considering picking up when it becomes available.